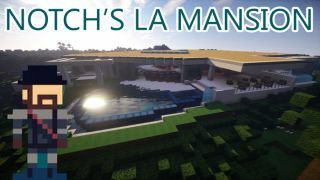 Well that didn't take long: The $70 million mega-mansion that Markus "Notch" Persson picked up last week has been recreated in Minecraft. Built by Dan Bovey, the recreation of Notch's new digs is an impressive piece of work, its accuracy highlighted by a picture-in-picture comparison to the real-life promotional video showing off the property in its pre-purchase state. There's even a glimpse of the famous "Candy Room," although Notch's feet are nowhere to be seen. Bovey said a downloadable version of the blocky Chez Notch is "coming soon" to his Planet Minecraft page. In the meantime, you can imagine what it's like to live in a billionaire's voxelized mansion with the video above.